The speakers that I've been using with my Power Mac G5 aren't exactly high-end. In fact they're about 13 years old. They're Apple Design Speakers, and they were made for Macs without built-in CD-ROM drives. You'd connect a cable from the CD-ROM drive to the RCA jacks on the back of the speakers and then connect the other headphone connector to the headphone port on the computer. They're perfectly decent speakers - or were at the time. Today they'd be considered rather basic, since all but the cheapest computer speakers seem to come with a subwoofer these days. The Apple Design Speakers have one driver in each enclosure, even though they have an opening to make it look like there are two (it's most likely a bass reflex design). But what I like about these speakers is that they're not big, yet they're fairly loud. Being beige, they blend in with the wall and other things on my desk - I want to see my monitor, not my speakers. I also like the ability to connect a device via RCA cables. I currently have my Mac connected that way, and my PC is connected via the headphone jack on the back of the speakers. This means no switching connectors or dealing with adapters. Unfortunately, the speaker cones in them are starting to disintegrate. Years of use combined with fairly dry conditions - as well as loud music - hasn't helped them stay functional. Oh, they still work, and after I repaired both speaker cones, they seem to work fairly well and probably have a bit of life left in them. But at louder volumes you can hear them buzz a bit, and certain types of music seem to accentuate that (anything with a double bass drum pedal, for example). I decided that maybe it was time that I started looking at what was available in computer speakers. I figured I'd check the "Made for Mac" section of Apple's website and found that they listed a number of different speakers. Listed, however doesn't mean that Apple provides much useful information. I had to follow links to the company's websites to find out most of the information; Apple simply provided a basic description and nothing more - not even a photo. Unfortunately, online I can only do a comparison based on appearance. In order to actually check out a speaker system, I have to hear it. The first thing listed was Creative's iTrigue i3350. At first it didn't seem to exist on Creative's website, however I was able to view their "new" 3400. I'm a bit picky when it comes to things like design, and the 3400 didn't really fit in with the rest of my desktop. The L3450 series was a bit better - but not perfect. I finally found the i3350, which was not on the iTrigue main page. It had been relegated to a small sidebar only visible once you're viewing another model. They're not bad looking, but Creative's rather confusing and poorly designed website prevented me from wanting to explore further. 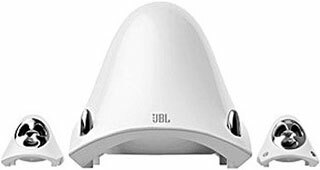 Next in Apple's list were the JBL "Creature II" speakers. JBL's website was a huge improvement over Creative's, and a dropdown menu was available to get me right to the page for the Creature II. "Was available", I say, because the site happened to be down. The unique look of the Creature II system prompted me to investigate further. It's available in four different colors: white, black, red, and aluminum. It's also not that large, which means it would blend in nicely with my desk. A review on CNET pointed out that the system is not the best for high volume listening, even though they apparently sound nice. The next on the list was a model from Klipsch, who has established a fairly good reputation with speakers. Their site is easy to navigate, and it was actually online. Unfortunately, the GMX-A 2.1 is rather ugly. It seems that it would be more at home next to one of those black Dell systems rather than a Power Mac G5. The next step up in their line is the ProMedia 2.1. It's quite a bit better looking, but still black, which does not match anything I have in the room - except for the computer monitor when it's turned off. At that point I established that I'm looking for something available in white with a green LED (remember, I don't buy electronics with blue ones). I checked out the Logitech website and managed to find their "Made for Mac" model, the Z4i. No, it's not a new version of the famous roadster. It's a rather nice-looking, not overly styled white speaker system. To be "paired with your Mac for an ensemble", they say. It's also got an input on the wired remote control for an MP3 player, or, in my case, my PC. Other options included the Harman/Kardon "Soundsticks II", which aren't bad looking at all. The subwoofer was originally released as the iSub for G3 iMacs to complement the internal speakers, and later on satellite speakers were added and the set was sold to go with the Power Mac. The trouble with early versions is that they were USB only, and therefore only worked on Macs - not with your iPod or other MP3 player - and only with relatively recent Macs at that. The Soundsticks II have an analogue connector, which allows you to connect them to any computer or MP3 player. I've heard the original version of these, and while they look stunning and the sound is good, they're not very powerful - more so than my Apple Design Speakers perhaps, but not compared to other speaker systems available for the same price ($169). Apple also lists the Yamaha YSTMS50 speaker system, which is not listed on the Yamaha website. I found a review from 2000, which points to them as fairly good speakers. I also like the design - placed at the corners of my desk, they wouldn't be very noticeable. The trouble, of course, would be actually finding them in a store. Regardless, it looks like my best option would be to go and listen to some of these speakers - and others - before I make a decision. I've got time; these Apple Design Speakers are currently playing Ayreon's album The Human Equation perfectly, without the slightest buzzing whatsoever. But sometime in the near future I might start going to stores and exploring some more options. And who knows, maybe Apple will come out with their own speakers again.